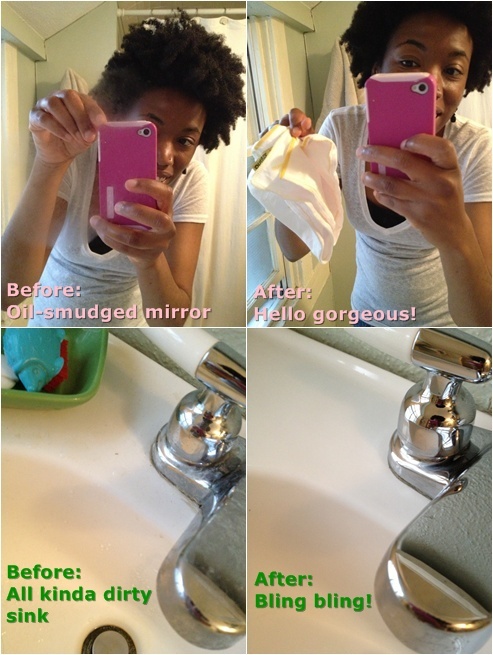 Last month, I saw a YouTube video of a woman cleaning a bathroom in just 4.5 minutes using ENJO products. It's possible to clean a bathroom in under 5 minutes with only water?! I just had to see for myself. bathroom glove: "classic bathroom fibre"
bathroom ENJOfil: "super-absorbent, streak free drying cloth"
bathroom maid: "handy cleaning of toilets and drains"
The website doesn't list prices but the ENJO representative told me the set is a $99 value. $99?! For some cleaning rags?!!! Even though I was getting them for free, my inner cheapskate was repulsed. These better be good, I thought. They were good. Immediately upon opening the package I could tell the ENJO products were of a higher quality construction than most microfiber cloths. An ENJO rep informed me that most microfiber cloths have a thread count of 400-600, while ENJO's is 2000-4000. ENJO fibers are 1/100th the diameter of human hair and each fiber has 90+ additional little surfaces along it's shaft to trap even more dirt and grime. The patented fibers are designed for mechanical cleaning instead of relying on chemicals (natural or synthetic) to do the dirty work. In fact, ENJO creates fibers for optimal cleaning of specific surfaces, so the kitchen glove's microfibers are cut like fish hooks to grab grease, while the bathroom glove is designed to best tackle soap scum and calcium build-up. So do fancier cloths make for better cleaning? I didn't clean my bathroom at all for an entire week and tried to use them in the same way the woman in the video did. I was most impressed by how well the bathroom glove cleaned my sink basin. I was almost blinded by how white it was! The ENJOfil drying cloth did a great job cleaning my mirrors even after I put my oily cheek against the mirror to give it a challenge! Good stuff! The glove didn't perform as well on my crappy acrylic shower/bath. I had to use lots of elbow grease. In the glove's defense, the previous tenants thoroughly scratched the surface and I use a heavy hair conditioner, so our bath area is always a little hard to clean. The ENJOfil wiped away a lot of what the the glove couldn't so ultimately things ended up clean. The toilet maid did a pretty average job cleaning my toilet bowl. It didn't look dirty, but it didn't have the "just cleaned", brilliant look I am used to getting from my toilet brush and Bon Ami. The ENJO website says if you have hard water you should also use their calcium dissolver. We have hard water here in Providence so I imagine that would have helped. Was I able to clean my bathroom in less than 5 minutes? No. The woman in the video didn't pre-wipe the sink and toilet top with a dry cloth before cleaning. She must live in a dust-free house with hairless beings because that doesn't usually fly in Chez Olivia. I too skipped this step, curious if dust and hair would miraculously cling to the cloth while cleaning, as the video suggests. What a mistake! I'm sure that added more time to my cleaning because I had to rinse the cloth and rewipe certain spots several times to remove hair. Also, I clean under the toilet seat, unlike the woman in the video. I'm not here to judge. I'm just sayin'. I believe ENJO could save you time if you are the type of person who juggles multiple types of specialized cleaners since it only uses water, but you really can't expect it to cut cleaning time down from 22.3 minutes to 4.5 minutes. Also, who spends 22 minutes cleaning a bathroom? Usually I'm done in 10 minutes, or 15 if I vacuum and mop the floor. Will I ditch my regular green cleaning regimen for an ENJO-based regimen? I loved the ENJOFil and I liked the glove. I'm keeping both in rotation in my bag-o-rags. Still, my current bathroom cleaning ritual using 3 simple green cleaners (Bon Ami, Viva Vinegar, and club soda) with pretty much any cloth and sponge works perfectly for me. Who is ENJO perfect for? I think the products I used would be great for someone who is new to green cleaning, has more disposable income, and is seeking to simplify her life. At $99 this initial investment is kinda steep but the cloths are designed to last 3-4 years with weekly use. If you also consider that you won't need to purchase cleaning products or take time to decipher product labels for safety, this could balance the price for a busy professional. I think ENJO products are also a great choice for someone with an apartment cleaner who either doesn't read English or isn't supersavvy about green cleaning. You'd need to make sure he or she knows which cloth to use for each surface, but you'd eliminate concerns about damages caused by using the wrong chemical product. Have you used ENJO products before? I'd love to read about your experience. Also, what do you think about cleaning a bathroom without any products? A few people on YouTube wondered if it is sanitary. I felt fine about it, but what do you think? Consider supporting my blog by purchasing green cleaning & fun home goodies selected by me via my Amazon shop. Thanksies. What a fun review! I like your style, Olivia. For me, I'm good using regular microfiber cloths from Target, Bon Ami, some natural cleaner (made with water, a little borax, some castille soap, and I think some baking soda? ), and another bottle filled with water and some vinegar. (Oh, and I do use nasty regular toilet bowl cleaner. I tried to go without it, but I really like the way it clings to the bowl). Mary, yeah, that sounds like a fun way to keep it simple. Have you tried squirting an eco-cleaner in your toilet bowl? I reviewed Even the Kitchen Sink (by Better Life) and found it clinged to the toilet bowl pretty well., even though it wasn't designed for that. What do you use to clean your bathroom floor? Any recommendation for wood floors while we are at it? I use Dr. Bronner's Sal Suds on my floor- wood or otherwise. I use it with a microfiber cloth mop. Sometimes I just spritz the floor with Viva Vinegar (see video in my blog sidebar) and wipe it with a cloth if I need a quick clean. Janitorial Supplies at Janilink. U.S. and International source for cleaning supplies, industrial cleaning equipment, janitorial supplies and cleaning equipment. Now anybody can buy products at wholesale prices from our huge inventory. WIWW: Yellow, How are You? WIWW: Vintage Victory and Chug-A-Lug Cheer!